We have EXTREME DEER HABITAT’s Dr. Jim Brauker. The Hinge Cutting Guru in the Habitat Industry in my opinion. We cover all things hinging. 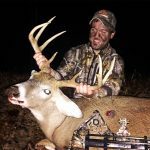 How to incorporate your hunting strategy w/ Hunting Hinge Cut Areas. Extreme Deer Habitat and Jim’s book!